Water quality is paramount, which includes lack of toxins/pollutants, clarity, and temperature. Also of great importance is the ecological health of the lake, including the substrate, benthic organisms, and the littoral zone—the shallower zone along the shoreline. 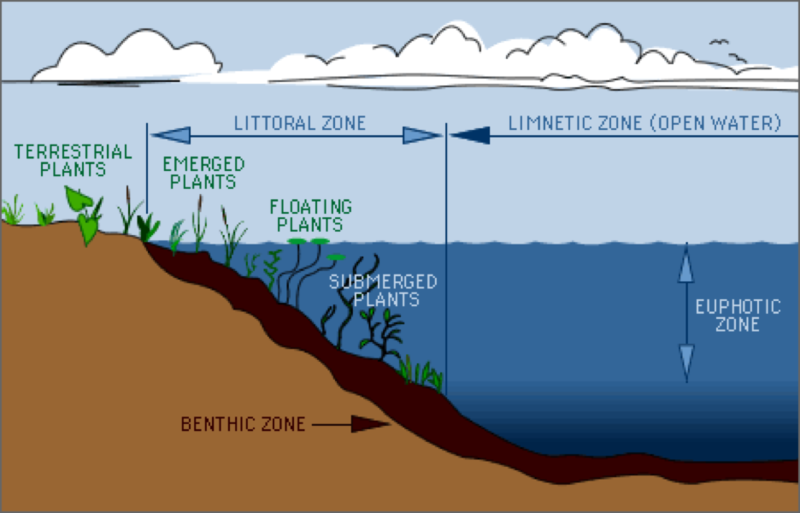 The littoral zone of a natural lake is the area from the shoreline to the outer limit of aquatic vegetation growth. When there is little or no vegetation, the littoral zone it is considered the shallower shoreline area to around 10 ft. deep to where light penetration is very low. Watts Bar Lake is a reservoir. It is more like a huge river than a natural lake ecosystem. Because the water depth fluctuates drastically during annual drawdowns, native aquatic vegetation has a difficult time gaining a foothold. Only a few aquatic species can survive fully exposed and dry for an extended period of time. Thus, the vast majority of the littoral zone/shoreline of Watts Bar is completely void of vegetation. Some non-native invasive aquatic plants easily survive an extended dry period of lake drawdown, and can thrive when the water returns and quickly complete take over. 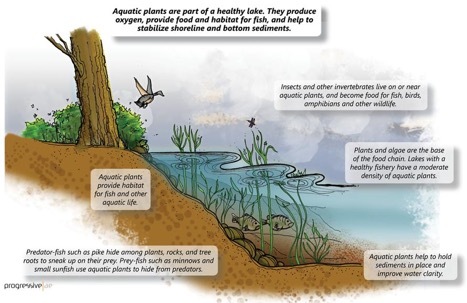 These plants can benefit the ecosystem, but because they often become extremely dense, their presence is extremely detrimental to every aspect of the lake’s ecological health. In a natural lake, the littoral zone produces a variety of native aquatic plants, not unlike a natural wooded ecosystem which produces a wide variety of grasses, weeds, shrubs, trees, etc. In a terrestrial ecosystem, this allows many places and habitats for birds, mammals, insects, etc. to live, feed, reproduce and thrive. The very same situation takes place in a natural littoral zone, where the aquatic vegetation provides those same attributes. A natural littoral zone can produce 90% of the food organisms for fish. The bottom substrate is the breeding and living area for many species of aquatic insects, snails, and invertebrates, as well as beneficial bacteria and algae. The plants themselves provide home and breeding areas for those organisms as well. When plants die, they become part of the detritus on the bottom, which is used as food for many of these organisms. This is a photo of a healthy and highly productive littoral zone in a natural lake. It provides everything needed for all organisms to thrive. Everything changes drastically when a single species of plant takes over in a terrestrial ecosystem or an aquatic ecosystem. When Kudzu takes over a young forest and completely covers every bush, shrub, and tree, nothing else can grow; and eventually it kills just about everything. Most animals cannot penetrate or live within the Kudzu, and even organisms that live in the soil can no longer thrive. The same thing happens in the aquatic ecosystem, only worse. Non-native invasive aquatic plants have no competition from native species, and therefore reproduce and grow at an extremely rapid rate. Unlike a natural littoral zone where the plants are dispersed around the bottom, invasive species take over every inch of the bottom substrate becoming densely packed together. When the invasive species reach the surface, they form a nearly solid floating mat. 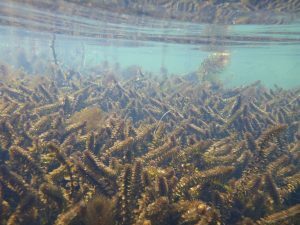 This growth of Hydrilla, pictured below, will reach the surface in only days, and even the surface water will no longer be available for fish. Hydrilla stems can grow as much as an inch per day. Hydrilla is known as the Kudzu of aquatic plants. This density completely alters the ecology of the littoral zone in detrimental ways to all the organisms once thriving there, including the fish. The littoral zones below are completely unavailable to fish and other aquatic organisms. Those areas have essentially been removed from the lake ecosystem. This eliminates hundreds of acres of productive fish habitat and has a serious negative impact on the fishery in the lake. The littoral zone is destroyed, and the ecological health of the entire aquatic ecosystem is under attack, including the fishery. The dissolved oxygen is depleted, fish cannot breathe, and few organisms can survive. The water temperature rises becoming too warm for native organisms. Water circulation with the mats is prevented. The water rapidly becomes stagnant. Sunlight penetration is blocked; thus, photosynthesis cannot take place. 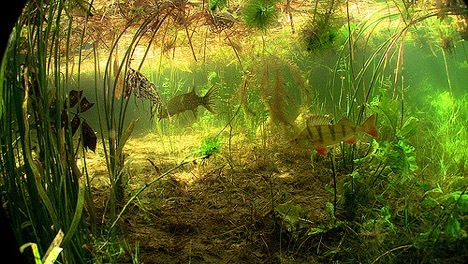 Fish cannot swim within the vegetation because of the density of the stems, the lack of oxygen, and the higher water temperature. These factors severely alter the benthic environment, and most benthic organisms die off. All fish habitat, such as snags, logs, rocks, artificial habitat, nesting sites, etc. is no longer available to the fish. Nesting fish cannot use their usual nesting sites, and cannot protect their eggs if already in the nest. Fish must find alternative food sources that are normally provided by the littoral zone. The high density of vegetation, water temperature, and lack of dissolved oxygen, allows detrimental bacteria to thrive. 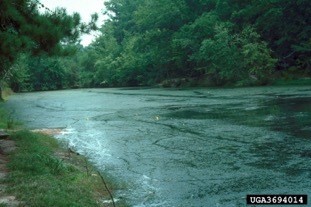 Siltation within the vegetation is increased, and along with the rotting vegetation, it will slowly fill in and lower the water depth. Over time this will completely destroy a shallow littoral zone, totally eliminating it for fish habitat. Waterfowl feeding areas are eliminated, and the dense mats can harbor bacteria deadly to waterfowl. When the huge volume of dead vegetation rots, it adds to the nutrient level of the lake and can cause algal blooms, which increases the rate of eutrophication (the aging of the lake). The mats prevent swimming and boat usage completely, and the smell of rotting vegetation can last a significant time. Dense mats totally destroy every aspect of the ecology of that area effectively removing from the ecosystem. Many fishermen believe the mats are beneficial to fishing. They are correct. Indeed, the “fishing” is often better. Thus, they also believe that because the fishing is better, the “Fishery” must also be better off. Here is where clarity is needed. The “Fishing” can indeed be better, as defined by “catching more fish.” Why is this so? Well, consider a large natural cove. That cove has many fallen trees, limbs, rocks, snags, nesting area, natural aquatic vegetation, and lots of habitat for the forage fish to feed, hide, and live, as well as the game fish to feed, nest, etc. A large cove will support thousands of fish when you include the forage fish/minnows, pan fish (crappie and sunfish) and game fish, and young/baby fish. There are literally millions of insects and invertebrates, a major food source for fish. All these organisms are all making a living in this cove. As the invasive aquatic plants emerge from the substrate, all is well until the density begins to increase. As the density increases, all those parameters mentioned above begin to take effect. This essentially removes the entire cove and all its otherwise beneficial habitats from use by the fish and food organisms. Yes, the entire cove is no longer available. All the forage fish, pan fish, and game fish are forced to the outer edge of the mat. The forage fish can only penetrate a small distance into the mats for protection. So the game fish stalk the outer edge of the mats searching for something to eat. Essentially, all the fish that were in the cove have to move somewhere else, and many stick around the edge of the mat. Thus, there are more game fish in a smaller area, simply because they were forces out of their homes. The density of game fish increases at the edge of the mat, at the cost of their normal, healthy environment. They can no longer feed, hunt, live, nest, or hide in the snags of the cove. That cove is no longer available to fish or food organisms, until the mat is gone, and even then, the left behind rotting vegetation has a very negative impact on ecology of the cove. 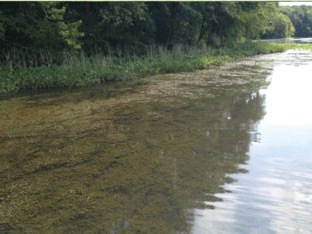 When a cove is covered with invasive aquatic plants year after year, growing and rotting, it is soon completely unavailable to fish and healthy aquatic organisms. The substrate is always covered with the remains of rotting vegetation and is no longer a healthy ecosystem. So, yes, the “fishing” may indeed be better, only because the fish are forced to a smaller area; but the “fishery” is significantly harmed. Remember, all the habitat, snags, food, nesting sites, normally found in that cove is taken away from the fish; thus they must go elsewhere to live and reproduce. As you reduce the amount of healthy littoral zone, you reduce the health of the fishery. Sooner or later the entire fishery will suffer a major decline. This is not speculation, this is ecological science and fact. Many Pro-Fisherman and fishing organizations know that non-native invasive plant species and dense mats are deleterious to fish and fishing, and support the eradication and control of such invasive species.